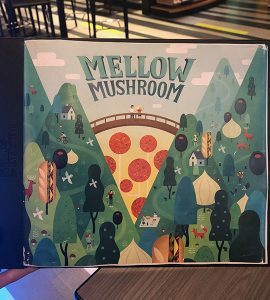 Location: 3811 S. Lindbergh Blvd., Sunset Hills, Missouri 63127, and over 150 locations in the U.S.
Offering what I would call the closest thing to deep dish pizza in the St. Louis area, Mellow Mushroom is one of my newest favorite places to eat. I found this restaurant through someone’s Instagram story; she posted a photo and tagged the restaurant’s location, which I then clicked on to explore the website itself and its menu. It appeared very modern and sort of a hole-in-the-wall type of restaurant. The name itself, “Mellow Mushroom,” does not explain the type of food the restaurant serves, but after reading the menu I found they specialized in pizza and offered dairy-free cheese, and then I knew I needed to go. 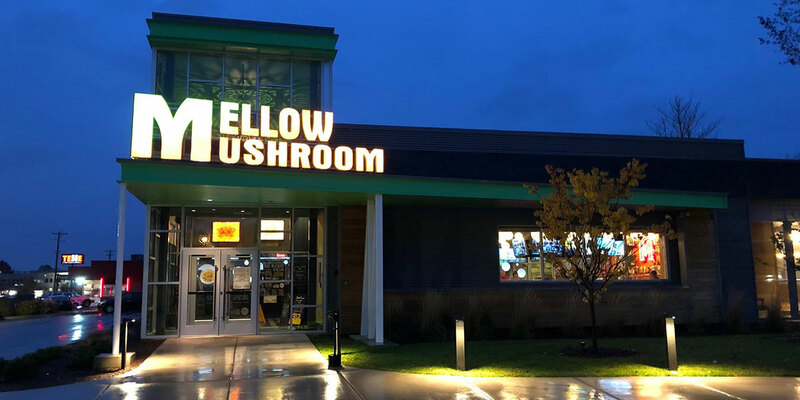 At the Sunset Hills location, the building looked almost like a McDonald’s playplace, in a good way — lime green and yellow, full of windows and the little mushroom guy outside, a very hip and cute building, but not at all what I was expecting. I was expecting a darker building both inside and outside, perhaps letters made up of license plates and tie dye everywhere. Outside, they have a beautiful outdoor space. Made up of a grassy area as well as concrete and gravel, there are about five booths and six picnic tables for eating outside. There is a full bar outside as well, built with rustic wood and bright-colored signs everywhere, even a giant menu displayed on the wall. There is a giant red piece of artwork that spells “Love.” I would call it somewhat out of place and not something I’d expect in that environment, but it makes for a perfect photo opp, which I’m sure gets them lots of free advertising on social media. Equipped with a band stand, outdoor couches and full bar, the outdoor area is perfect for an evening out or a spot when you’re waiting to be seated, at least when the weather warms up again. On a recent Saturday night, their parking lot was packed. We had to park across the street and wait about 40 minutes for a table; a bigger parking lot would be nice. The inside was a little cramped, there were lots of families with small children and not much space in the entryway. Once seated, our waiter was very nice and cool, asking if we had ever been there before and if we had any additional questions while taking our drink orders. It was a very clean environment, nothing like a typical pizza place with grease all over the tables. The menu was adorable, with little mushroom people all over it, very bright and cartoon-like. Food-wise, they are known for their pizza and calzones, but also has a good variety of sandwiches, wraps and salads. Their pizzas are offered in a create-your-own style or you can choose from menu types they’ve created for you. Pizza has always been a food that I like every once in awhile, but having a dairy allergy makes it very hard to eat. I’m biased, but this is the reason why I love Mellow Mushroom. They have allergy-friendly ingredients including vegan cheese, gluten-free crust and vegetarian options, and it actually tastes good. It’s hard to find good dairy-free cheese that actually tastes like real cheese. It’s awesome that more places are becoming allergy friendly. I think the world is finally starting to understand that not everyone can eat everything. I’m always up for trying new places that offer these options. For someone who rarely gets to eat pizza, this particular pizza was amazing. It tasted like deep dish Chicago pizza, hot to the roof of my mouth, cheesy as ever and the slices were huge. The slices are more wide than they are long, which makes them more difficult to eat, but essentially makes the pieces bigger. Ordering a medium, containing about six pieces, my boyfriend and I ate the whole pizza being very hungry from a busy day. I’d recommend this restaurant to anyone who likes to customize their pizzas and anyone who has specific dietary needs. With perfect food and atmosphere for any time of the year, Mellow Mushroom is a restaurant that you need to try.